Fifty-eight percent of consumers say that eating healthy and knowing what they’re eating is important to them, according to recent research by Chicago-based research firm Technomic. But at the same time, Technomic also reports that the word “healthy” means different things to different age groups. Millennials, aged 22-37, associate the word healthy with lower calories and less processed and natural foods, whereas Gen Z, aged 21 and under, think it exemplifies foods that are organic, authentic and homemade. But above all, says Darren Tristano, executive vice president at Technomic, flavor and taste matter most for 70 percent of consumers. This dichotomy is critical for foodservice directors responsible for feeding college students—who fall somewhere within Gen Z and the younger millennial category—because their menus must balance health and flavor in order to appeal to student desires. What does healthy mean to Gen Z? “The younger generation has a different definition of healthy. [Healthy] has to fall into the context of affordable, fresh and local, vegan and vegetarian,” says Tristano. He also says that younger consumers seek out menu items that are close to a food’s natural state, such as hand-cut French fries with the skin intact. Additionally, college students want their food to be prepared in a transparent manner. “They’re used to seeing it and knowing what they’re getting,” says Tristano. “When the kitchen is open view it builds trust through visual recognition.” This is one reason why this group is drawn to build-your-own fast-casual concepts such as Chipotle and Blaze Pizza. Angel Alcantar, assistant director of culinary operations and executive chef at University of Wisconsin - Stevens Point, understands well what his student customers want. He oversees a foodservice program that includes a food court with seven different dining concepts, a traditional all-you-care-to-eat dining hall and a convenience/grill option, all of which are responsible for feeding 3,200 students. Seven years ago, Alcantar’s department transitioned to a self-operated dining facility from a contracted one. After feedback from students indicated they wanted healthier choices, he established relationships with local farmers to provide seasonal produce and meats. “We have relationships with 12 to 15 farmers to provide all our greens, tomatoes and meats for the deli, including grass-fed beef,” says Alcantar. “Our students care about healthy eating and sustainability, so as we move into the growing season, we use more fresh and local farm products. 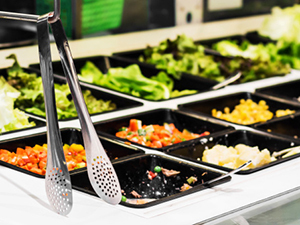 One of the university’s most popular dining concepts is Fresh Cuts, where students can choose from a variety of greens and proteins, seeds, cheeses, beans and other vegetables, which are chopped, tossed with dressing in a bowl, and then served in a fresh crepe shell and stuffed into a cone to go. Fresh Cuts appeals to all diners, including vegans and vegetarians, says Alcantar. Students can also choose how much dressing they want on their salads, which allows for flexible portion sizes—something that’s very important to them, according to Tristano. “Being involved and having a say in how much is added or included is appealing to this generation,” he says. At first, explains Alcantar, his staff was making dressings in-house, but students wanted more variety, and it was difficult for his staff to keep up. “When we looked at Litehouse, we said, ‘why recreate the wheel?’ This is something proven. Our students are the ones who make the choice, and they gave rave reviews of the Litehouse products,” he says. For more information about on-trend, healthy salad dressings, visit www.litehousefoodservice.com.